Idea taken from comment on Breadtopia. Bought the cereal specifically for this and I wouldn’t repurchase as a hot cereal. I prefer steel cut oatmeal or plain oatmeal to it. First 12 hours: it didn’t do much at all so I added more water. 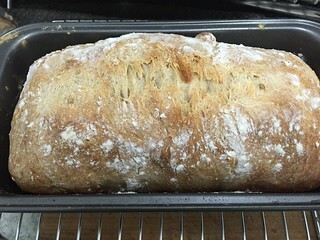 [At this point I lost the notes for this bread] All in all, it was ok. As usual, great crust, but I am not crazy about it. However, it did toast well. Maybe better some others. Hmmm. Idea taken from this blog. I did not have the hazelnuts or walnuts, but I had the flours. 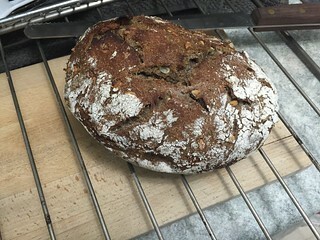 First time using buckwheat flour too. First rise with a tea towel cover but not much bubbles after 16 hours. I added more water. I think I packed the flour too much. Started second rise at 22 hours. Bread turned out too “wet”. I want to do it again. I also didn’t notice the chia seeds at all. Recipe from Jim Lahey’s book My Bread which has the basics for this no knead bread. Initial Rise was 9.5 hours. Second rise 1.5. 25 mins in 450 covered. 15 mins uncovered. Should have used some WW flour or used bread flour as stated. While the raisins were delicious. All the ones on the crust burnt and were inedible. Still a good bread. My second attempt at making a more typical bread loaf with this recipe. Using tips from Food 52, The Kitchin, and Mostess. After the first rise (19 hours), I patted the dough into a rectangle, folded bottom third in, folded the top third over that, pinched the seams, and folded in one more time. Plopped it seamed side down in a coconut oiled 8×4 loaf pan and put some oats at the bottom as well. I let it rise in the loaf pan for another hour. I slashed it down the middle and put some flour on it before putting it in the oven. 450F for 30-35 mins. Internal temp should be 160-190F. Let cool at least an hour before slicing. Good results. 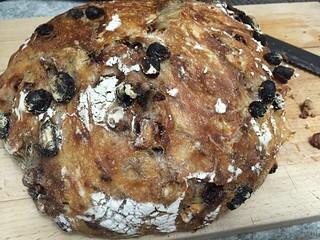 I made this loaf for my Dad as he likes to eat typical sandwiches and I think I’ll make it again for him but with a raisin twist. 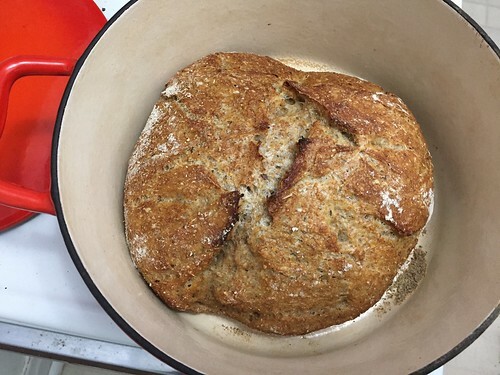 At this point, I have found a no knead sourdough recipe (more on that in another post), but I will continue using this Jim Lahey/NY Times recipe because it has been consistent and it’s very easy to add other ingredients. Now that I can get good results from making loaves and learned some new tips with hydration from sourdough, I’ll continue using this recipe. This bread diary series will continue and more photos to come as well.